If you were serving a long-term prison sentence right now, what words or images do you think would come to mind? After this most recent performance at Walker State Faith and Character Based Prison, I asked the prisoners to share two words or themes they wanted connected to the music for the next recital program. (I’ll reveal those later!) The words I had chosen for this recent recital were Space and Intent. I picked pieces that exposed elements of space, whether silences or long phrases, and pieces that captured various tones of voice to represent Intent. 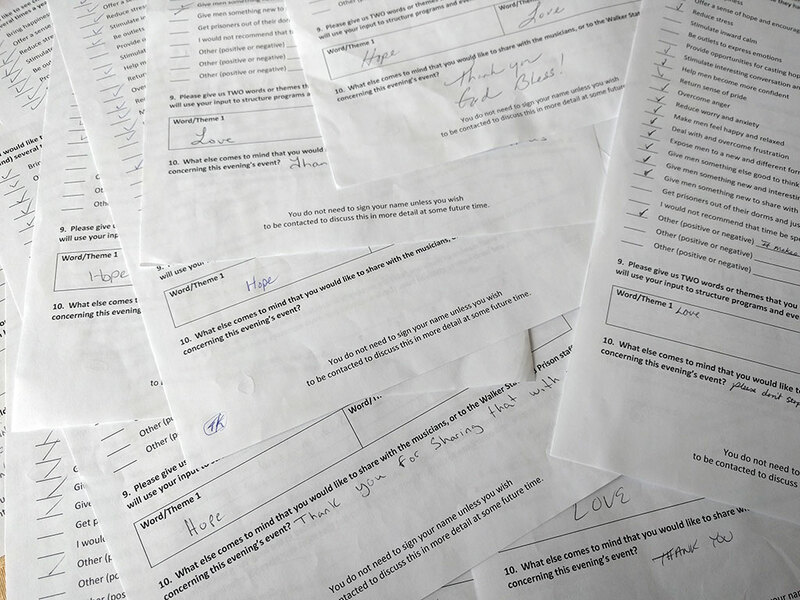 In reviewing the surveys that we asked the prisoners to fill out, once again they shared that it was extremely important to have a chance to share their opinions or thoughts about the works. But another point that came to light was that live performance was much more important than just hearing recordings. The prisoners consistently shared that they valued the connection they felt just by watching performers communicate while playing. Small nods, facial expressions, breaths together, and synchronized bowing added an important impact that communicated more effectively than a recording could. It also made it real and sincere, two things in very short supply on the inside prison walls. I am now planning the next recital. Collecting the prisoners’ most requested words yielded a nice surprise. I was expecting they would request words or themes like Redemption or Reconciliation or Loneliness. But the most requested words/themes were….Love and Hope. Love and Hope are what we all need as humans. I’m considering pieces I’d like to use and composers I’d like to spotlight. But I know in planning a musical offering of Love and Hope, interacting with the inmates — watching them be real and sincere, I will likely walk away from the prison with an even more profound sense of the words and the music. Great article about the great work you’re doing.